Every stone a story, like a rosary. Dramatic changes are taking place in the Earth system that greatly affect human beings, from global warming to earthquakes. We need to understand these in terms of their causes, their rates, and their long and short-term effects. The spread of huge ice sheets over what is now Canada and the northern U.S.
We now know through radiometric dating that the unchanging laws of physics and chemistry have had billions of years to work on the Earth. Even at infinitesimal rates, vast changes have taken place that would be invisible on the scale of human history. Also, rare catastrophic events have made big changes over short periods, but humanity has only witnessed and recorded few of those. Given our short career as observers, it seems reasonable that we also use the past to understand the present. In particular, we rely on an Earth history approach for several of the abstract, overarching concepts central to science, particularly for evolution, plate tectonics, and climate change.Learn more here. Some of the most spectacular results of these processes, such as speciation and the rearrangement of continents, do not occur often or quickly enough for us to record our observation of them. Much of our understanding of speciation and large-scale plate tectonics is extrapolated from modern observations of microevolution and the plate tectonic activity we have discovered and observed over the last few decades. What Do We Want Students to Learn? Earth history is largely about using evidence. It is probably more important for students to learn the processes to infer these events from geologic clues rather than for them to memorize the dates of the biggest impacts or the extent of the widest ice sheets. The interpretive skills it stimulates will serve students well in many other contexts. You also can use an Earth history approach to teach students to look for patterns and rates of change (Dodick and Orion, 2003b ) on a variety of scales. 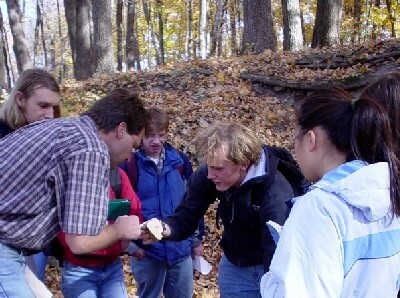 Students and scientists frequently employ quantitative and deductive skills as part of an Earth history approach on a smaller scale. Communities worry about local risks like floods and forest fires. Have they occurred in a particular system before, or recurred? When, how badly, and is there any pattern? Problems like these enable students to connect their observations of the present, their deductions about the past, and the needs of the community together. One important lesson we can derive from the study of the last few millennia is that the effect of the human race on the Earth's systems has increased exponentially over time. In order to clearly understand these effects and their consequences, as well as the potential ways to deal with them, we need to study past and ongoing changes over the long term. Earth history approach stresses the rate of change. The geologic past offers a sobering perspective on the rates of human resource use and environmental degradation (Miller, 2001 ). Natural resources like coal and oil form only under limited conditions which have only occurred a few times in Earth history, but are being consumed rapidly. Likewise, it takes thousands of years for a meter of topsoil to develop, but months or years for it to erode. Also, human beings are gaining increasing influence on geologic and biologic processes that are too big, or ordinarily take too long to be readily observable. Citizens need to understand the carbon cycle and the natural variations within it to make wise decisions about global warming and they need to understand evolutionary processes to be ready to deal with cloning and genetic engineering. See Panel 1 in Ireton, Manduca and Mogk, 1997 . What Is an Earth History Approach?